Buying a new air conditioner is an investment, which means you need to buy from someone you can trust. At Del-Air Heating and Air Conditioning, we have more than three decades of experience helping customers just like you make the right choice for their homes and families. Our team doesn’t just understand air conditioning, we’re experts. In fact, every member of our team is an expert installation and repair technician. In addition to our internal training, all Del-Air techs receive manufacturer training. This means you can not only trust us to provide the AC you need, but have confidence that a highly-skilled team is available to provide the routine and preventative maintenance you need. We are a leading U.S retailer of Carrier, Trane, Lennox, and Goodman/Amana, and service all brands. Additionally, our team of experts can help you find the AC unit that best meets the needs of your home and your budget. SEER stands for “seasonal energy efficiency ratio” and contributes to the overall efficiency of your air conditioning unit. Units with a higher ratio can help you save money on your electric bill by using less energy to cool your home. According government standards, an AC doesn’t meet HEPA standards unless it generates at least 99.97% clean air. With HEPA filtration, you can have confidence that you and your family are breathing clean air. Whether you’re simply looking for the best AC unit or have specific concerns about your air quality – such as pets or allergies – keeping the air you breathe clean is important. There’s more than one way to save when you buy a new air conditioner. At Del-Air Heating and Air Conditioning, we can help you take advantage of the latest manufacturer rebates and tax credits. If you’re looking for an energy-efficient unit, you may qualify for an energy company rebate, too! Financing is an easy and convenient way to pay for your new Del-Air Heating or Air Conditioning system with a monthly payment plan to fit your budget. Del-Air Heating and Air Conditioning offers a variety of annual maintenance plans to help you get the most mileage out of your cooling system. We’ll even give you a free consultation to help you understand which annual maintenance package is best for your AC. 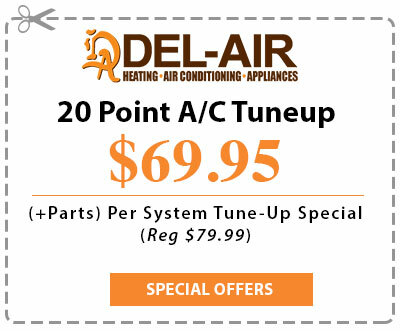 Del-Air offers 5- and 10-year extended parts and labor warranties that will save you money on any needed repairs beyond year-1 (the term of most manufacturer’s warranties). Our best price guarantee includes brands that we sell and ensures that you get the best price possible for your air conditioner – or we’ll pay you $500! Learn more about our $500 best price guarantee or contact us today to schedule an appointment for your free consultation. Contact Del-Air Today by Calling (844) 574-4578.